Mu Deng Shi-Fu, along with 30 of her disciples who live in Xilai Temple and many other followers, has a grand vision for transforming the consciousness of China, especially the young generation, and the world, moving away from mindless consumerism and toward a spiritual path. I was utterly impressed by the quality of her students and the harmony and joy in Xilai Temple. Some of the young residents, who used to hold prestigious and high-paying jobs in Beijing, Shanghai, or Guangzhou, decided to drop everything in the city and come to join the movement in Xilai; some were already social entrepreneurs and change-makers in impact investment and B Corp before they came; some were artists and free spirits wandering in their world travels or leading a conventional family life. Each of them has an inspiring story to tell. 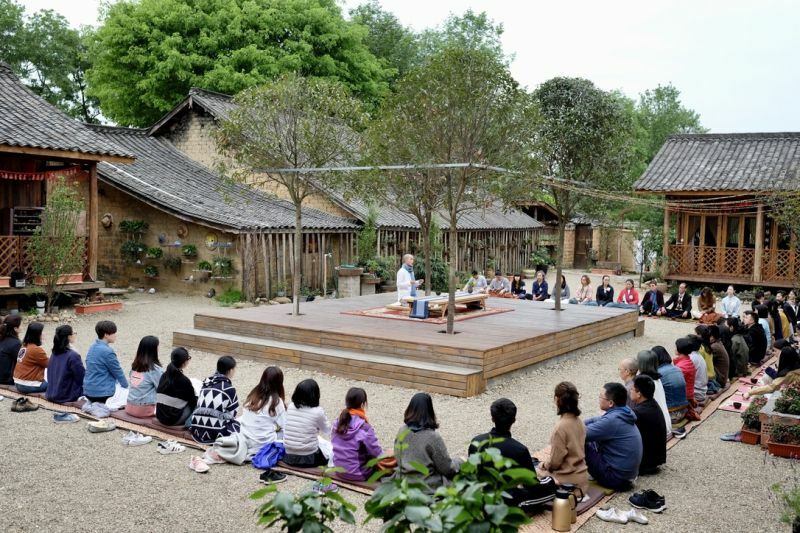 As they continue to use their talents, skills and social connections to help build this new spiritual community, they learn to listen to birds, smell flowers, work in the fields, cook, drink tea, meditate, and organize public events inside and outside the temple. They’re inspired by Mu Deng Shi-Fu to live simply, fully, and gracefully, tuned in to the delicate details of life in each moment. Daqing, a friend from Beijing, met us in Chengdu and invited us to Hua Dao Eco-Community (华道生态社区) where he is a member. We happened to visit during their canola festival, introducing and sharing eco-knowledge, regenerative living, and traditional teachings and art. Many local villagers came. 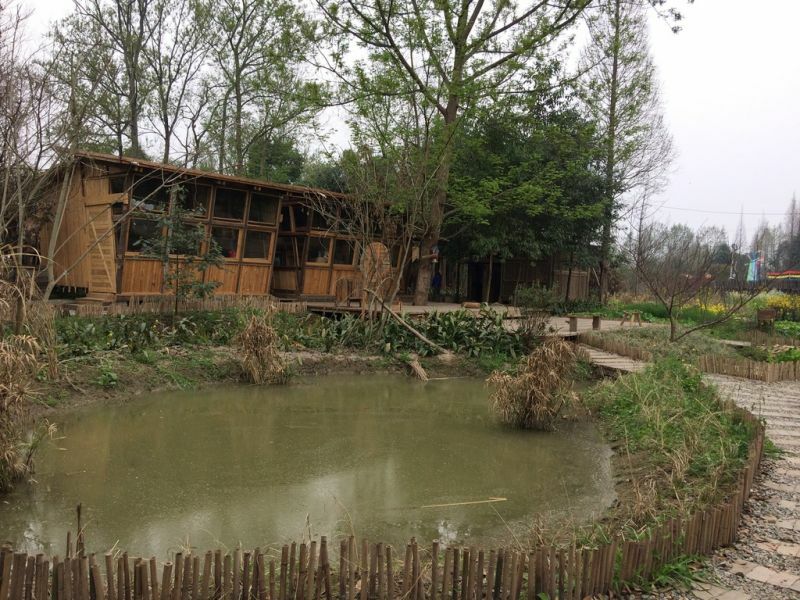 Daqing visited Findhorn Ecovillage in Scotland a couple of times to learn about Eco-living. 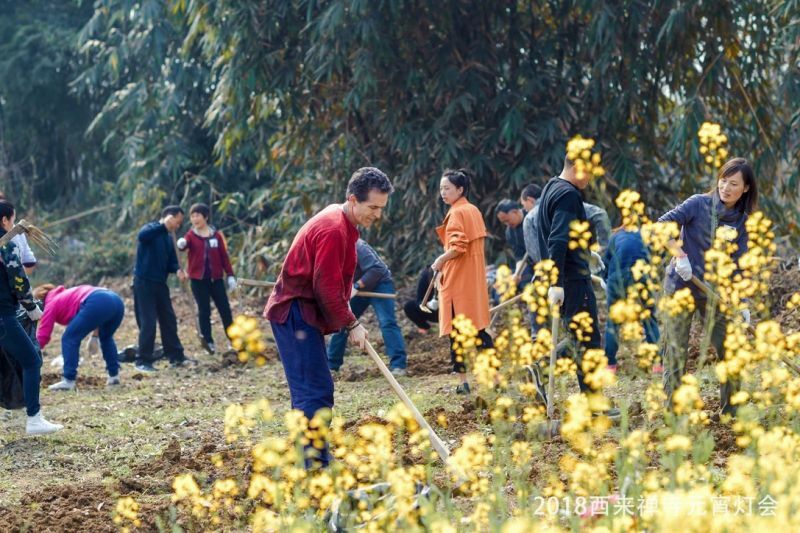 Many Hua Dao members are active in organizing eco-events across China. Hua Dao was built through crowd funding from mostly entrepreneurs, intellectuals, and activists, who share the vision of co-creating a new civilization on the planet that nurtures the relationship between humans, between human and Nature, and society. 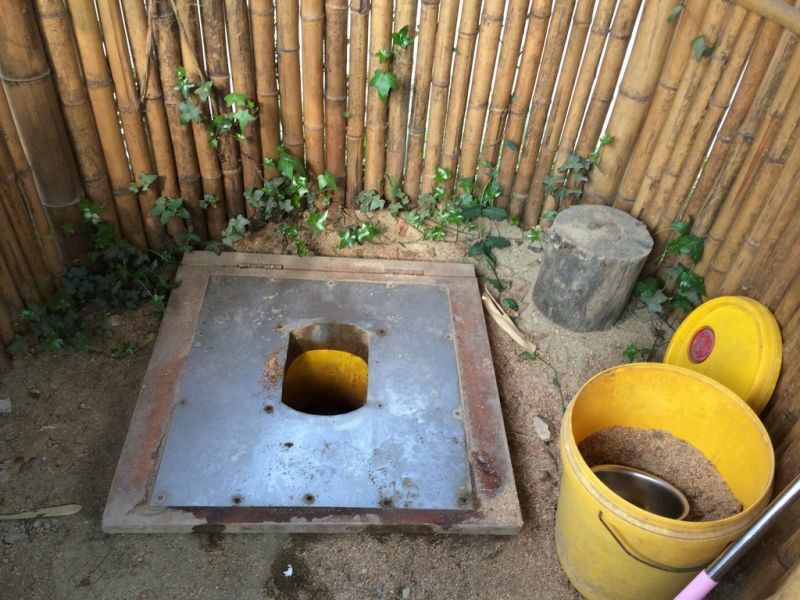 Through challenges, mistakes, and patience, Hua Dao Eco-community is slowly implementing new ways of living. Due to the high speed life in the city, very few members are able to actually live in Hua Dao full time. But when they do show up, the childlike smiles on their faces are profoundly moving, as they drop a seed in the soil, dye a piece of cloth, or make tofu from scratch for the first time. 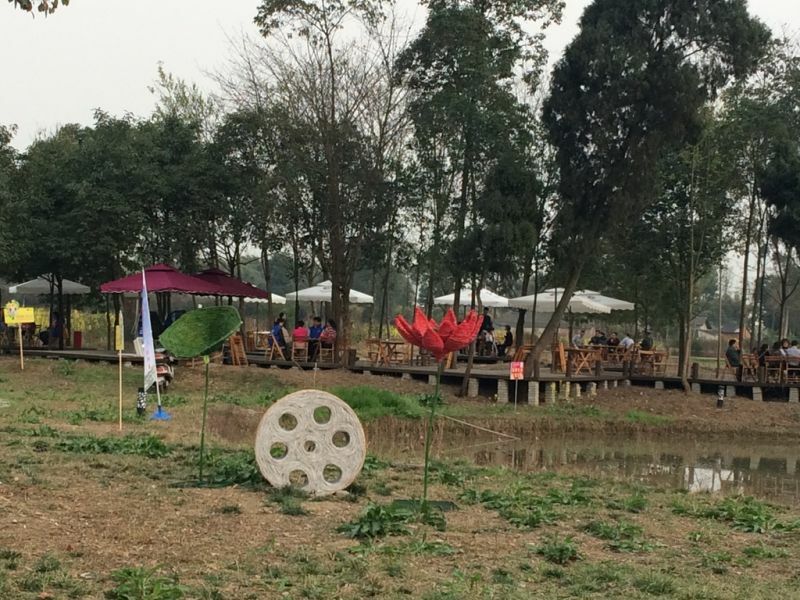 The neighboring Fan Pu Eco-Farm is considered a rare success, which has attracted young people to work or volunteer there full time, offering programs for city kids and their parents to experience the farm and make art. 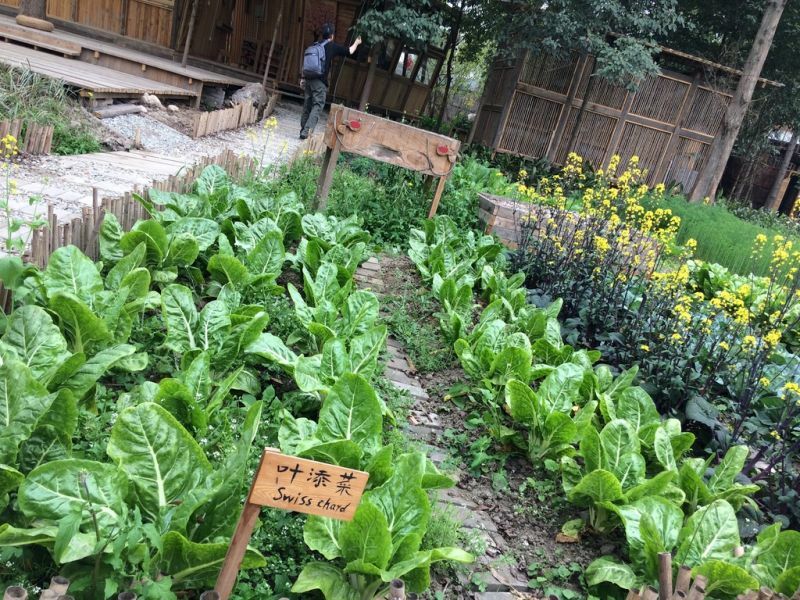 I participated in a 3-day workshop in Chengdu Waldorf School, the first Waldorf school in China founded in 2004, and learned a little about Rudolf Steiner’s Anthroposophy and biodynamic agriculture. 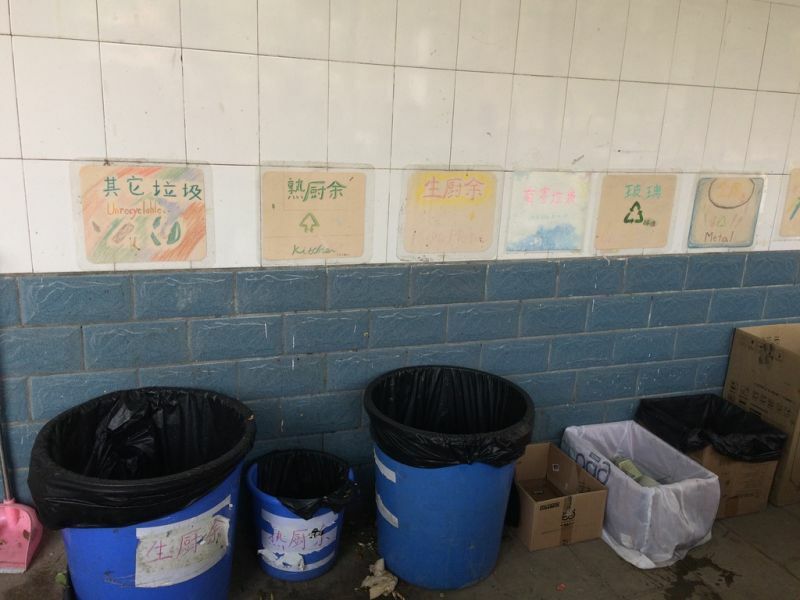 On campus, it was so heartwarming to see kids climbing trees during recess, playing with toys handmade with natural materials, washing dishes with camellia seed powder instead of dish detergent, separating garbage, using compost toilet, and working in the gardens. The school also provides ongoing workshops on nature education, theatre, voice, and art therapy for the parents and teachers, often taught by guest teachers from the global Waldorf community. After hearing their descriptions of the workshops offered there, I was amazed by their openness and willingness to explore life on such a deep level. Through friends in Hua Dao Eco-community, we met Pachamama Alliance volunteers in Chengdu and Beijing. Pachamama was translated to “Earth Mama” in Chinese. We offered them contage workshops, which connected us deeper through improvised dance, and our shared concerns for the ecological sustainability in the future and the compassionate actions that we can take. Start small. 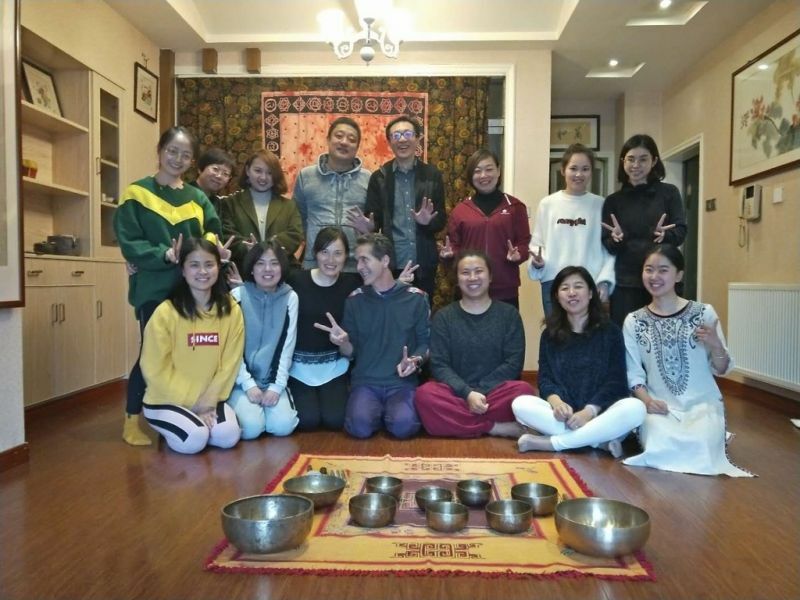 In Beijing, the group that took our workshop stayed connected and invited more mothers to start the change, first at their own homes, reducing, reusing and recycling, and organized Awakening the Dreamer workshops created by Pachamama Alliance. 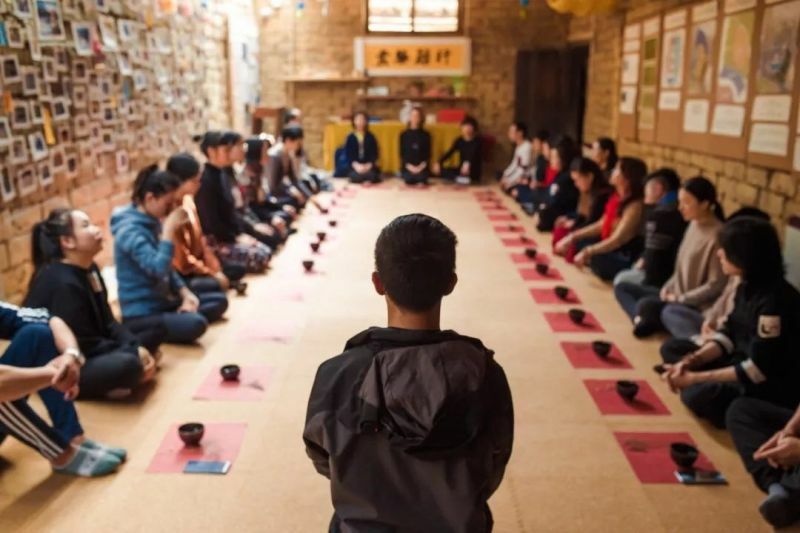 Last year, Andy found online this Snow Mountain Retreat Center located at the foot of Jade Dragon Snow Mountain in Yunnan Province, and spent several wonderful days there, bonding with the staff and volunteers. 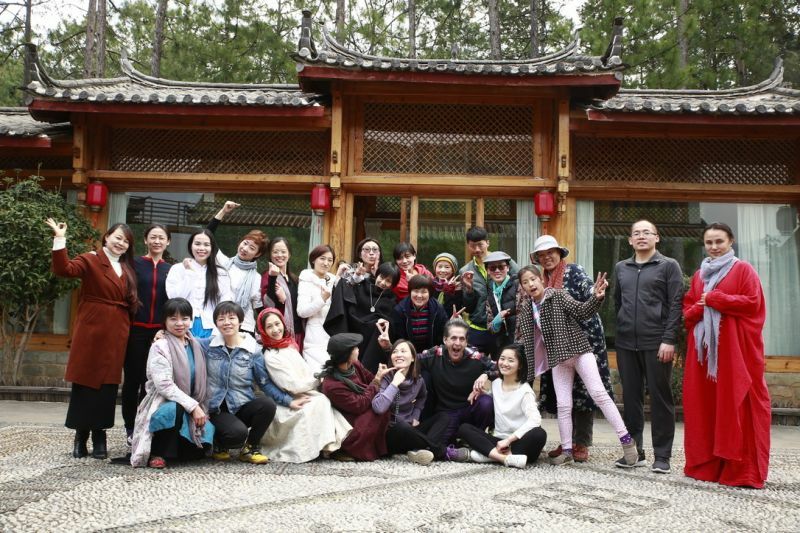 It turned out that this center was founded by Gyangiri who founded Mountainyoga in Beijing in 2003, the first yoga retreat center in China. It offers an ongoing 28-day holistic yoga teacher training program each month. 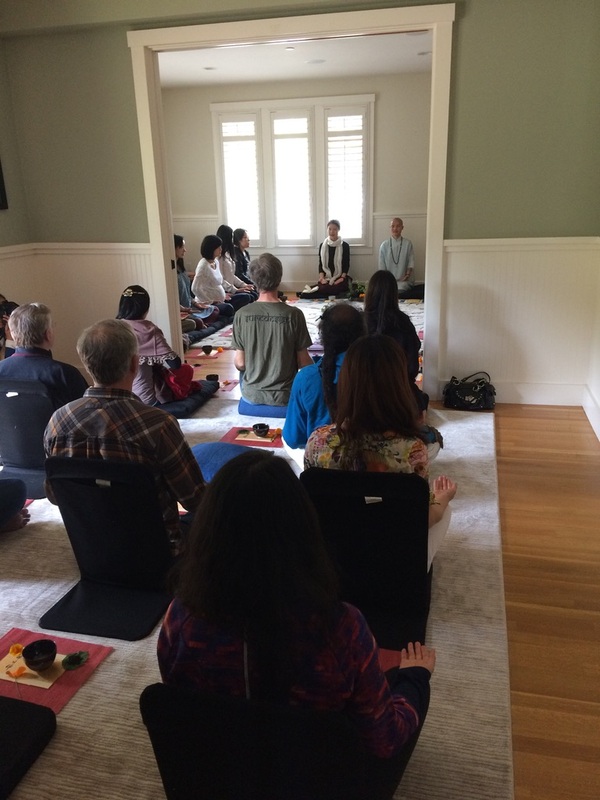 At the end of the 28-day training when we were there, Gyangiri said to the group that the secret of this practice is not about perfect yoga poses, but LOVE. This year, Andy was invited to do a four-day workshop there, and he invited me to be his co-facilitator. We spent lots of time brainstorming what we could offer. We named the workshop “Little Spark,” blending contact improvisation with mindful touch and massage, which Andy and his late wife, Deb Hubsmith coined the term, “contage.” We decided to offer it as a gift. We started our first day of the workshop by singing our picked theme song, “Time to be Happy.” Facing 25 participants, we expressed our gratitude to be there. Each participant took turn to introduce themselves and offer the group a stretch followed by the rest of the group. We were surprised by how creative and open every one was. We soon laughed off our nervousness, as curiosity and joy flowed into our hearts. 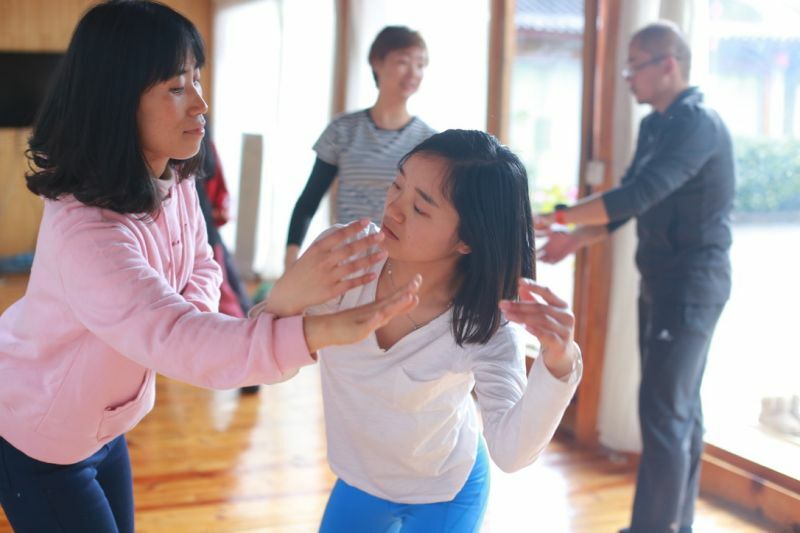 As the workshop progressed, it opened us up from a culture that human touch is rare, rapidly built trust and connection among strangers, and further connected each of us to our own authentic movement that was not dictated by thoughts. Within a couple of hours, strangers danced together like playful children, including those who said they had never danced before. In the evening, we showed some short videos on kindness and ecological awareness and held discussions. They were all well received. I had never before experienced such deep joy in service. What a gift that each one was giving me! It was the most healing experience for me. Through word of mouth, within a month, we were invited to do workshops in different cities. 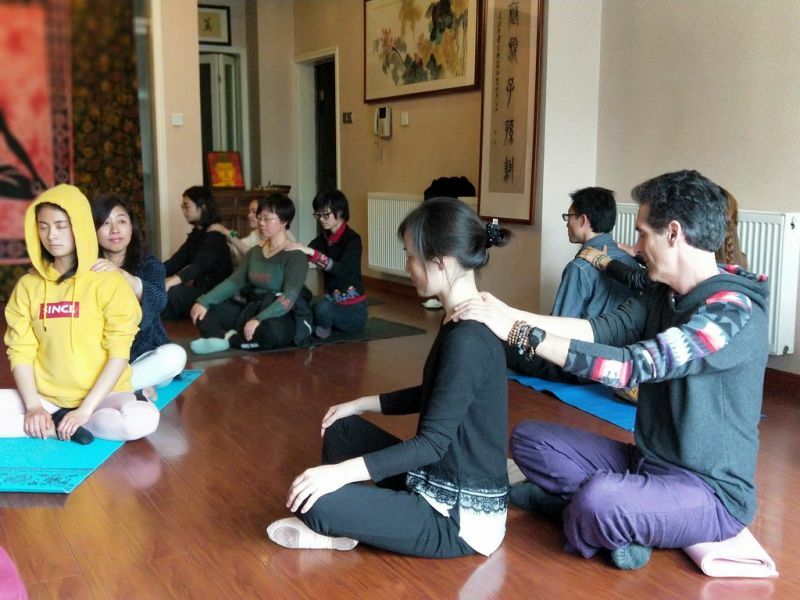 So far, we’ve offered our workshop in Shanghai, Xilai, Chengdu, Lijiang, Tianjin, and Beijing. The closing sharing circle was the most powerful, as each shared our deep gratitude for each other’s openness and kindness. As one participant who is a civil engineer said, "I don't like socializing. This is the first time that I shared in any salon. When I arrived here earlier, I felt alone, but gradually, I began to have body contacts with other participants and connect with everyone. In the process of establishing connection, I felt warmth, gentleness and kindness, and I put down my defense, broke out of the confinement of my little self, and expanded it to the entire group, the entire room, and at the end, I could dance freely in relaxation. I thank everyone here, thank the teachers for giving me such an opportunity to feel kindness in this world." A young man, who volunteered at Hua Dao Eco-community, told me that he was in military for over 10 years. His entire military experience had been rescuing those in need in earthquakes and floods. Being in service to others had become his way of life. A year ago, though he had a hard time leaving his buddies in the military, he left, knowing that he needed to expand his horizon outside. And he continued to volunteer, especially in nature-related education. He wants to explore a better education for his one-year-old baby. 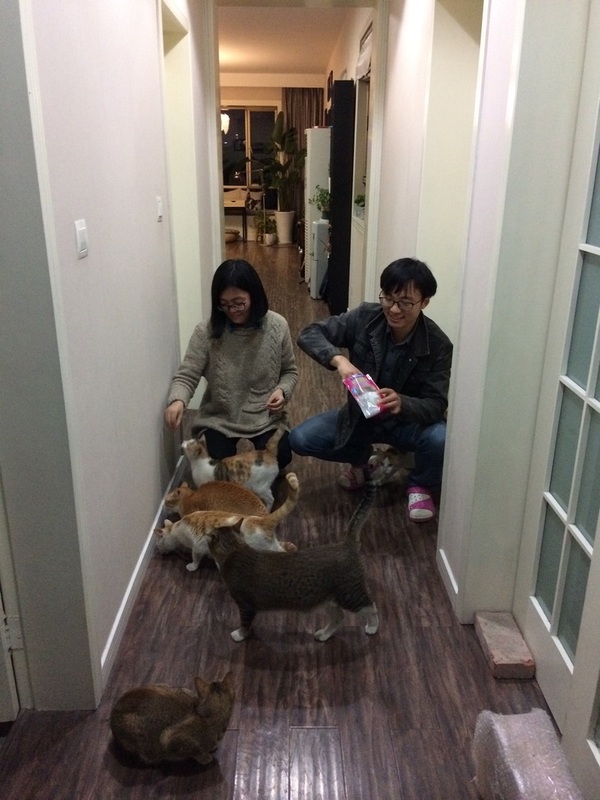 During the workshop at Chengdu Waldorf School, I stayed at an Airb&b, run by a young couple who rescued six cats from the street over the years. Each cat had a story where and how they rescued it. Like a miracle, the sick skinny homeless cats were transformed into healthy and happy spirits with distinctive characteristics under their care. Last year, my mother told me that several years back, one day when she was on her way home from the market, she saw an old man fall on the street by himself and then pretend he was injured. But no one came to help him until a young man, whom my mother knew, hurried to get him up. But the old man grabbed the young man and accused him for hitting him and demanded being taken to the hospital. The young man took the old man to the hospital. My mother saw the whole thing but didn’t have the courage to come up to tell the truth to the surrounding crowd, as she knew that old man too. She went home, feeling heartsick. After hearing the story, I said, “Ma, after all these years, why not go visit that young man and tell him what you told me?” This year when I visited home, my mother told me that she visited the young man, who told her that he didn’t need to pay at the hospital as the doctor found out what was going on. But he felt compassionate for the old man who did get hit by someone earlier that day. That evening, the young man insisted putting my mother’s bicycle onto his vehicle and giving her a ride home. They had a sweet conversation during the ride like a family. Truly, "it’s getting better and better, worse and worse, faster and faster." How shall we hold the two possible outcomes? To paraphrase what Joanna Macy, one of the greatest elders of our time, said, the worst thing is not the destruction caused by irresponsible human behaviors that harms life on Earth, but the deadening of our hearts and minds. We ought to feel and honor our fear and despair in order to understand what’s beneath that fear and despair—our love for life. As Joanna wrote, we don’t know for sure if we are midwives for the new life-sustaining future or the deathbed attendants for the dying. But either way, we can always live this life in awe as the sun rises every morning because life itself is a miracle and we are forever grateful.